Norman Control heavy-duty laundry cart dumpers from Talley Machinery empty bulk laundry carts quickly, safely and automatically. At the push of a button, an entire 800-pound load of soiled laundry is raised, rotated and emptied onto a sorting table or conveyor then returned to position for removal. 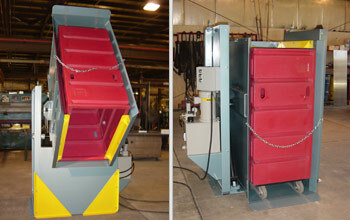 Worker contact with fully loaded laundry carts is reduced and manual soiled laundry removal is eliminated. For laundries with tunnel washers relying on efficient sorting of incoming soiled linen to achieve throughput targets, these heavy-duty, automatic linen cart dumpers provide an important boost in speed as well as in worker safety.